Find your perfect facial care products with the Dr. Hauschka skin care test. Knowing that we are prepared to meet the daily challenges of everyday life with a smile gives us a sense of relaxation and tranquillity. In our creamy Rose Deodorant, we use a carefully formulated combination of gentle, deodorising and nourishing ingredients. Rose water lends an elegant, delicate fragrance while Alchemilla essence helps to gently regulate perspiration. To top it all off, when essential rose oil meets high-quality jojoba oil, the skin receives an exceptional kind of care that one can’t help but feel happy about. Our low alcohol roll-on is especially suitable for normal to sensitive skin. It has a harmonising effect, contains no pore constricting aluminium salts and does not stain your clothing. 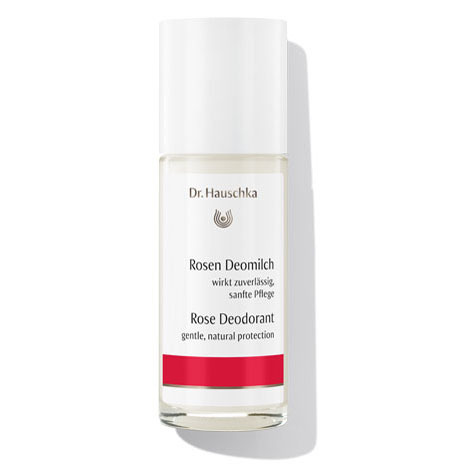 Apply the Rose Deodorant to the underarms using a gentle back and forth motion. Repeat application as needed. Water (Aqua), Simmondsia Chinensis (Jojoba) Seed Oil, Alcohol, Manihot Utilissima (Tapioca) Starch, Glycerin, Zinc Ricinoleate, Ricinus Communis (Castor) Seed Oil, Glyceryl Caprylate, Rosa Damascena Flower Water, Rosa Damascena Flower Oil, Fragrance (Parfum)*, Citronellol*, Linalool*, Geraniol*, Eugenol*, Limonene*, Farnesol*, Citral*, Benzyl Alcohol*, Alchemilla Vulgaris Extract, Cetearyl Alcohol, Cetearyl Glucoside, Hectorite, Xanthan Gum. * The amount of this product is currently too high. Love it. I have a very sensitive skin, most deodorants and antiperspirants make my skin itchy. This doesn’t, it’s very silky smooth, and very comforting on my skin. Will be a regular purchase from now on. Elegant and safe yet efficient even in harsh sun as tried in Australia. Looked for a deodorant that was natural and suitable for sensitive skin and this seems to fit the bill. Not too heavily perfumed and has not caused any irritation so far. Love this product, wear it every day! Rose Deodorant harmonises perfectly with the warming and comforting Rose Nurturing Body Cream. Those who spend a lot of time on their feet will be thrilled by a foot massage with invigorating Hydrating Foot Cream as well as the strengthening power of Revitalising Leg & Arm Tonic.